As good as leafy greens are for you, how realistic is it for a two-person household to consume a large bag of kale before it goes soggy? Chances are high that the bag will dwindle down to about a third full before moisture overtakes the sprightly greenery, making it into a mess of spoilt food. Leafy greens are a delicate product, easily susceptible to spoiling from both moisture and air in an uphill battle against two duelling elements. Add bacteria to the mix and the cell walls are quickly torn down yielding a wet, slimy leaf. This is not inspiring news. Nobody will feel inclined to eat healthy after experiencing this just a few days from purchase. Fresh veggies have cells full of water that push cell walls out, a state known as turgid. The moment veg is cut off from a water supply, water within the cells will evaporate causing the cell walls to collapse inwards. From there, leaves begin to wilt. Once water stores have been thoroughly depleted, the cell walls will break down. You can thank this process for the layer of slimy leaves at the bottom of your bag of greens. I’ve had many a bag of spinach go sour after just a few days of opening. I’ve tried washing the bag, drying thoroughly, and sealing in a Ziploc bag to no avail. It’s gotten to the point that I simply rubber band the open bag of unwashed greens. They seem to fare a bit better, but it’s not a real solution. With that, let’s get into the proper way to store leafy greens and extend their life past normal expectancy. My first instinct, to store washed greens in an airtight container, was incorrect. Sealing them does not prevent water evaporation from the cells; it does prevent evaporated water from leaving the immediate area. It lingers cloyingly in the air around the leafy greens, adding unnecessary moisture and weight. The spoilage process occurs at a more advanced rate when greens are stored this way. There is a school of thought that believes that preparing produce the moment you bring it home will make the week’s cooking a breeze. Those people are correct. Taking care of the prep at the same time as or shortly after putting away groceries means less time spent scrubbing and chopping before dinner. Next time you buy a leafy green (i.e. spinach, kale, swiss chard, lambsquarter) be sure to prep it for storage. Pick out any wilted leaves. Discarding of ones that don’t look great will cut down on the release of Ethylene, a gas released by ripened produce which causes other produce to ripen more quickly. Fill your sink or a bowl with water and add your greens, swishing them around a bit. Let them sit for a few minutes to allow dirt to sink to the bottom. If you’d like, add a little white vinegar to the water to get rid of bugs in waiting. Remove the leafy greens from the water. You’ll want to dry the leaves as thoroughly as possible at this stage. Use a kitchen or paper towel, although a salad spinner is the most efficient way to dry. Lay the dried leaves on a tea towel or paper towel with no more than two to three leaves per spot. Roll up the towel and secure it with a rubber band. Storing them in a towel will wick away any moisture that forms over time. Place the rolled-up towel in a plastic grocery bag and store it in the veggie drawer of your fridge. You want the bag to be open in order to allow moisture and Ethylene an outlet of escape. There is one other way to prolong the life of leafy greens past a week or so. Frozen food items like fruit and veg will stay good for much longer than expected. 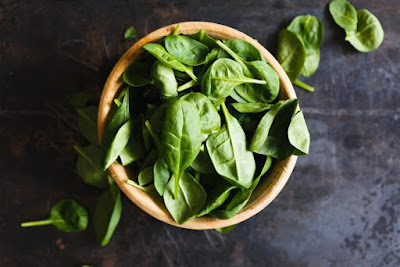 Frozen spinach will keep for 10 to 12 months and frozen bananas will stay good for three to four months. What an effort- and money-saving notion! The process for freezing leafy greens is a little different to simply prepping them. If you simply pop the greens into a Ziploc and throw it in the freezer, the water in the cells will freeze, expand, and burst. To prevent this, dunk the leaves into boiling water to kill bacteria and soften the plant fibres. Remove any bad leaves and stalks/stems, if desired. Fill a large bowl with water and ice. Submerging the greens after blanching will halt the cooking process. Blanch the greens for about a minute, soaking them in the ice bath for an equal amount of time. Dry the blanched leaves with a kitchen or paper towel or a salad spinner, squeezing any excess moisture out in the process. Prepare your freezer bags by labelling them with the type of green, amount, and date. Divvy out your blanched greens into their corresponding bags, making sure to trap as little air as possible in each bag. If you’re feeling really adventurous, try pureeing spinach with water to make spinach ice cubes. The cubes can be used in smoothies, sauces and stews or use them to add a flavour punch to rice.